A rendition of Marriott’s Edition Hotel on Sunset Boulevard, projected to open early next year, as seen from Harratt Street. A study by CBRE Hotels’ America Research forecasts a strong hotel market for Los Angeles next year, even as the supply of hotel rooms increases. That may be good news for West Hollywood, which is the location of major new hotel development and where the hotel room tax is the largest single source of revenue for the city’s General Fund. However, a CBRE study shows that from January through July this year the revenue per available room (RevPAR) in West Hollywood, an industry measure of both occupancy and rate, has declined by a larger percentage than in other areas of Greater Los Angeles that CBRE surveys. In that seven-month period, the revenue per available room averaged $222.27 in West Hollywood, a decline of 6.3% compared the $237.13 average revenue per available room in the same period the year before. By contrast, Beverly Hills saw a 3.3% increase, Santa Monica had an increase of 5.4% and Hollywood’s revenue per available room was up 1%. The occupancy rate for hotels in WeHo in that seven month period was 80.37%, a decline of 3.5% from the same period last year. In Beverly Hills, the occupancy rate increased 2.2%, in Santa Monica it increased 1.4% and in Hollywood it was up 1.7%. CBRE’s September 2018 Hotel Horizons study forecasts that average daily room rates for hotels in the Greater Los Angeles region will increase 2.7% to $186.54, slightly higher than the likely national average of 2.6%. That is despite the fact that the number of new hotel rooms is expected to grow by 2.8% next year, CBRE reports. “The Greater Los Angeles region is among the top-performing markets,” says an announcement of the CBRE report. CBRE estimates that average rates this year will be 3.1% higher than the $181.56 in 2017. Another hotel business measurement is revenue per available room (RevPAR), which is an industry measure of both occupancy and rate. CBRE says that is expected to rise 2.7% to $144.65 in the Greater Los Angeles area this year and is forecast to climb an additional 2.7% to $148.57 next year. That compares with an average 2.6% increase nationwide forecast for 2019. In the Greater Los Angeles area, occupancy is expected at 79.6% in 2019, essentially unchanged from the 79.7% expected for this year, CBRE reports. West Hollywood, a geographically small city of only 1.89 square miles, is home to 20 hotels with more on the way. The latest to open is the La Peer on La Peer Drive just north of Melrose. Next will be the 190-room Edition on Sunset Boulevard, forecast to open early next year. 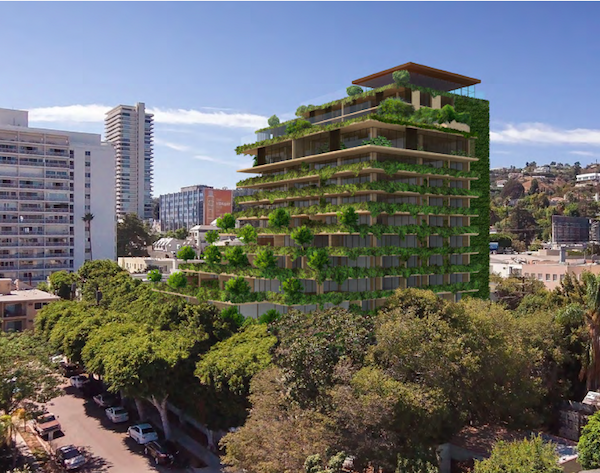 Recently approved by the West Hollywood City Council is the 240-room Robertson Lane. Several other projects, including ones on Holloway Drive and La Brea Avenue, have been proposed by developers. Steve Witkoff, the developer of The Edition, has called out West Hollywood as an ideal hotel market. The Edition “is the best located hotel within West Hollywood, a high barrier to entry market and one of the highest RevPAR submarkets in the country,” Witkoff said. UPDATE: This story has been updated with specific additional information regarding the average rate per available hotel room in West Hollywood compared to that of other nearby areas. The condos in the picture above start at over 5 Million. Just saying. I get why it’s good for the city, but I think it’s sad that there’s only or two moderately priced places to stay in the city. Everything is becoming for the wealthy only. So the tourists can enjoy the scruffy strip and filthy sidewalks throughout the city.